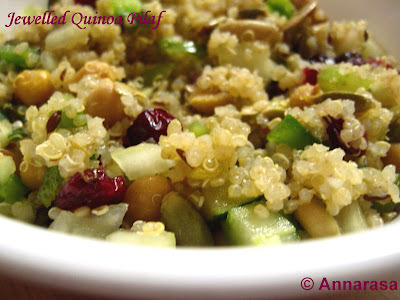 Jeweled Quinoa Pilaf is just one such recipe that I created some time back. Its quick, easy, healthy, and perfect for cold winter evenings. As you will see, it uses seasonal items from the pantry, but the addition of celery and cucumber add that unbeatable fresh taste that brings with it memories of the summer. Cook the quinoa as per the directions on the packet. Using a fork, fluff, cover, and set aside. Heat the oil in a non-stick pan. Add the garlic cloves. Fry for a minute. Add the cumin. Add the chickpeas and a quarter cup of water. Cover and cook until the water in gone. Next stir in the celery and green peppers. Cook for a couple of minutes. Add the quinoa, Season with salt and pepper. Finally, throw in the cucumber, pepitas, and cranberries. Stir everything together. Check seasoning. Turn off the heat and leave covered for about 5 minutes. Serve warm. The crunchiness of the pepitas and the sweet-tartness of the cranberries give this pilaf an amazing taste and texture. This dish serves well as a main dish but is also a great idea for a yummy and healthy side!! The Jeweled Quinoa Pilaf with Pepitas and Cranberries goes to Priya @ Mharo Rajasthan. She is hosting Cooking with Whole Foods: Quinoa this month. 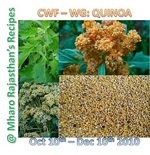 CWF - WG was started by Kiran of Sumadhura blog. Looks so beautiful Apu, great job !!! Lovely looking Pilaf...and healthy too..yum yum! Thats a healthy,wholsome and filling pilaf, very inviting..
Wow, a pilaf with quinoa, what a great idea! looks yum! what r pepitas? @ R: Pepitas are basically pumpkin seeds You can find them in the supermarket!! They make a great snack too. This is very much my kind of dish. I snack on pepitas and love them.